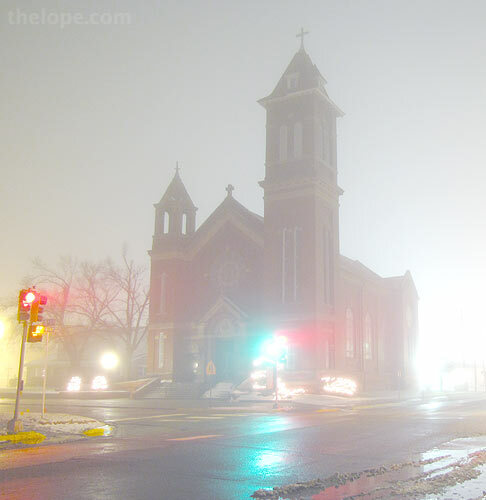 Fog engulfed St Teresa Church in Hutchinson, Kansas, this past Thursday night. Evaporation of snow from earlier in the week had left plenty of moisture in the air. Whether it's Teresa or Theresa is a bit foggy when you're searching for the church on the Internet as both spellings appear in what seem to be sanctioned Catholic church pages. Parishes Online offers a link to the Hutchinson's St Theresa church, but that link actually connects you to St Teresa in Summit, NJ. The closest thing to a website the church seems to have lists it as St Teresa, which is also what appears on the church's sign. While writing this, I also learned that there is academic disagreement as to styles of abbreviation but that abbreviations commonly do not have a period if they are not made of sequential letters of a word ("professor" is "prof." while "saint" becomes "st"). I learn something new everyday, even if I'm somewhat foggy on religion.